1. Jeff Long, Arkansas athletic director. Being boss of the Hogs is not why Long tops this list. Being chairman of the inaugural College Football Playoff selection committee is why. Welcome to the most pressurized, scrutinized seat in the sport, Jeff. 2. Jerry Jones, Dallas Cowboys owner. Has established JerryWorld as the capital of college football. The College Football Playoff championship game will be played in his building Jan. 12. The most interesting game of the opening weekend will be there, too: Oklahoma State vs. Florida State on Saturday. Between those big-time bookends are four other college games – including the Cotton Bowl – further stamping the massive stadium as more than just the home of the Cowboys. 3. Hugh Page, chairman of the University Committee on the Academic Code of Honor at Notre Dame. The university vice president and associate provost heads a group that will decide the appropriate punishment (if any) for four football players being investigated for academic fraud. The ruling could have a profound impact on Notre Dame's season. 4. Jon Duncan, NCAA Vice President of Enforcement. Has caught some flak for the lack of Division I Committee on Infractions hearings – now 14 months since the last one. But that may change in the near future, with several cases said to be working through the investigative phase. Will any of them impact the eligibility of current players? We'll see. 5. 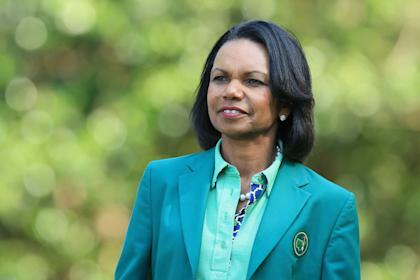 Condoleezza Rice, College Football Playoff selection committee. The outside-the-box appointee to the selection committee generated some spirited (and chauvinistic) debate last year on whether she is suited for the job. Most of her work (and that of the other committee members) will be invisible to the public – but don't think for a minute that will shield her from criticism. 6. Jeremy Foley, Florida athletic director. His Cadillac program leaked a lot of oil last year. Now Foley could be faced with a major decision over whether to stand by Will Muschamp or change coaches in an effort to recapture the Tebow/Urban glory days of years past. 7. Dave Brandon, Michigan athletic director. See above. Just change the names of the school and the coach (Brady Hoke in this case) and Brandon is in virtually the same situation as Foley. 8. George Mitchell. The retired U.S. senator is in charge of annually updating the NCAA on Penn State's progress in implementing institutional changes in the wake of the Jerry Sandusky scandal. Last year, on Mitchell's recommendation, the NCAA reduced sanctions against the school. This year's report, if it is favorable, could result in a further reduction of sanctions – including possibly lifting the school's bowl ban. The depleted Nittany Lions may not be good enough to reach bowl eligibility this year, but they could get a huge motivational boost in September from Mitchell. 9. Drew Borland, Marty Couvillon, Scott Prather and Stephen Prather, SportSource Analytics. Came out of nowhere to be named the primary statistical resource of the College Football Playoff selection committee. Not associated with any of the more familiar computer ratings formulas, SportSource will provide mountains of data to the committee on all the teams under consideration. The data should be helpful in side-by-side team comparisons, but will statistical minutiae make the task of choosing the best four teams more clear or more complicated? 10. Mark Emmert, NCAA president. Hasn't been a great year for the head of the most controversial governing body in American sports. Will major rules changes ease the turmoil within the NCAA membership or exacerbate it? Will the assaults upon the amateurism concept subside or intensify? Will Emmert strengthen his embattled position, or lose even more support? 11. John Swofford, Atlantic Coast Conference commissioner. Ninja Swofford saw his league break up the SEC title dynasty, and defending champion Florida State starts this season No. 1. The league also made the biggest addition of 2014, bringing Louisville aboard. All signs point to continued gridiron prosperity for a conference that had underachieved for several years prior to 2013. 12. The eighth official. The Southeastern Conference becomes the latest league to experiment with an eighth official on the field. Is it an acceptance of the hurry-up, no-huddle offense? Or an enabler of it? How you feel may depend on how fast your favorite team likes to play. 13. Ramogi Huma, National College Players Association president. Wrongly dismissed by many in the sport as a lightweight, Huma earned some credibility by helping bring the Northwestern union movement to a vote. Will there be more "All Players United" statements during games this season? Stay tuned. 14. Jim Delany, Big Ten Conference commissioner. His league may have performed competitive subtraction by addition, adding Maryland and Rutgers for 2014. And there already were competitive concerns before that. But the Big Ten Network continues to be a cash cow and will only produce richer milk with the added relevance on the East Coast. 15. Catherine Conti, official. She will be part of the officiating crew for the Southeast Missouri-Kansas game Sept. 6, becoming the first female to ref a Big 12 game. After years of working Mountain West games, she gets a significant opportunity to advance the cause of female officials everywhere. 16. John Skipper, ESPN. The most powerful man at the most powerful media entity in college football. Will ESPN's long-established penchant for cross-promotion of its own programming lead to a disproportionate championing of the SEC, whose new network rather aggressively launched in concert with ESPN earlier this month? The four other power conferences will certainly be watching to see if ESPN's August celebration of all things SEC carries over into the season. 17. Larry Scott, Pacific-12 Conference commissioner. Has a conference flush with talent and boasting its deepest coaching pool ever. If there is a league capable of challenge the overall supremacy of the SEC, this is it. But August talk is cheap; will the Pac-12 back it up on the field? 18. Judges To Be Named Later, Ninth Circuit Court of Appeals. Will hear the appeal of the landmark O'Bannon v. NCAA ruling that was a victory for athletes seeking compensation that has been denied to them for eternity by the rules of college sports. If Judge Claudia Wilken's ruling is upheld, the floodgates could be opened for plaintiffs suing the NCAA for even more in other courts. 19. Bob Bowlsby, Big 12 commissioner. Sounded the alarm on the state of the NCAA earlier this summer, declaring that "cheating pays." Failed to back that up with any specifics, and notably did not mention the ongoing investigation at Big 12 member Oklahoma State. But Bowlsby got everyone's attention, and some believe he might one day make a better president of the NCAA than the current leader. 20. Tom Jurich, Louisville athletic director. Made the most controversial hire of the offseason, bringing back prodigal son Bobby Petrino. Will the move that delighted Louisville fans but appalled many outside the city pay immediate dividends heading into the ACC? Or does Jurich live to regret trusting one of the least trustworthy characters in recent college football history? 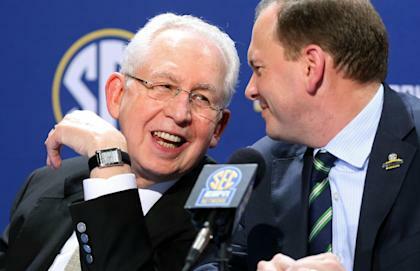 21, Mike Slive, Southeastern Conference commissioner. Didn't enjoy seeing the SEC's incredible seven-year run of national titles end, but will enjoy seeing the playoff he championed for years finally come into existence. The question is how much longer Slive wants to go before ending one of the great commissioner tenures ever. 22. Jimmy Sexton and Trace Armstrong, CAA Sports. Powerhouse agent duo continues to spread their influence. Sexton clients Nick Saban and Gus Malzahn got richer with new deals to stay at their respective schools. So did Armstrong client Kevin Sumlin. Armstrong also helped client James Franklin upgrade from Vanderbilt to Penn State. If there are high-level coaching vacancies this winter, expect to see their clients involved. 23. Steve Patterson, Texas athletic director. First hire in the athletic shakeup in Austin didn't seem to have much control over Mack Brown's fate. But Patterson's future may be tied to Brown's successor, Charlie Strong, who has done a search-and-destroy operation on discipline problems in the locker room. If Strong succeeds on a Texas level, Patterson's life should be pretty simple. If Strong doesn't succeed, the AD could have a short shelf life in Austin. 24. Greg Schiano, temporarily unemployed. After a brief and miserable NFL experience, Schiano looms over the Rutgers program as it makes the daunting transition into the Big Ten. If Kyle Flood's third year goes badly, the lobbying will intensify to bring back the man who made the Scarlet Knights respectable. If Rutgers doesn't call him home, another school undoubtedly will make a run at him. 25. Kevin Plank, Under Armour CEO and prominent Maryland booster. Did lasting damage to the eyeballs of college football fans everywhere a couple of years ago with the introduction of the horrendous Maryland uniforms. But the outfitter's influence continues to spread, especially now that it has locked up Notre Dame as its biggest client to date. Just Missed the List: Lee Fitting, coordinating producer of ESPN's "College GameDay"; Britton Banowski, Conference USA commissioner and chair of NCAA Committee on Infractions; Bill Hancock, College Football Playoff administrator; Shawn Eichorst, Nebraska athletic director; Julie Hermann, Rutgers athletic director; Kirk Herbstreit, ESPN college football analyst; Verne Lundquist and Gary Danielson, CBS SEC broadcast team; Sandy Barbour, Penn State athletic director.